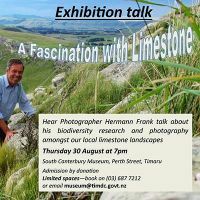 An illustrated talk by Hermann Frank about the rare plants and creatures that inhabit our limestone landscapes. Hermann will be sharing his fascination with our amazing limestone landscapes that he has been studying. You'll also have the chance to have a closer look at his photographs in the Landscapes of Dreams exhibition.